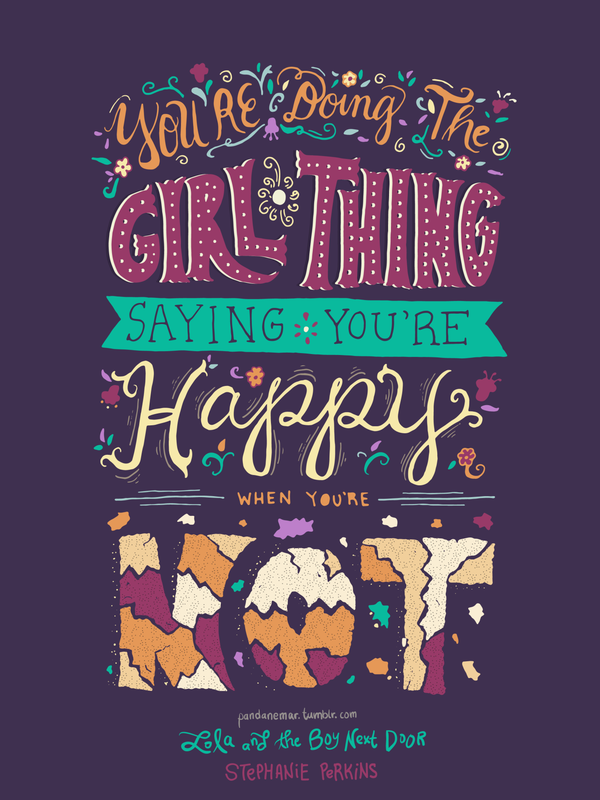 I was recently talking to a friend about some of my favourite high school RomComs similar to 10 Things I Hate About You and she hadn’t seen quite a few of them. So I’ve decided to share some of my fave RomComs set in high school in the late 90s and early 2000s. If you ever just want a feel-good cute and hilarious romantic movie then these will definitely do the trick. I’ve also linked all the trailers at the bottom, after my little graphic, so that you can check them out a bit more if you’ve never seen them. Also, don’t prejudge the trailers because they are pretty bad and the movies themselves are much better. 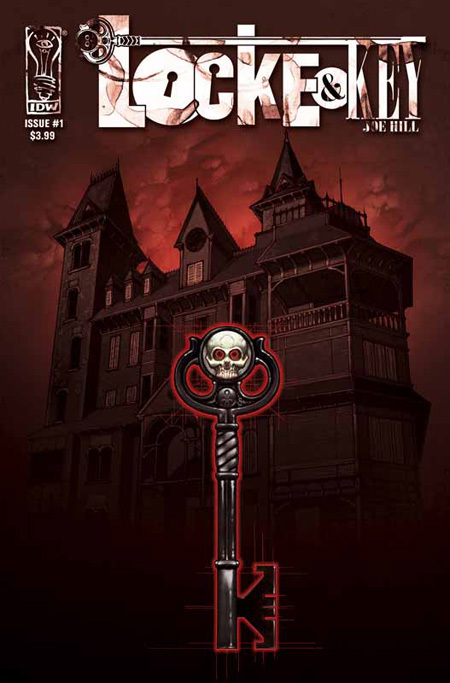 Locke & Key tells the story of Keyhouse, an unlikely New England mansion, with fantastic doors that transform all who dare to walk through them, and home to a hate-filled and relentless creature that will not rest until it forces open the most terrible door of them all! Until now I’ve never really been able to get into graphic novels. I’m not sure if it’s that they’re more expensive than books, that you read through them so quickly, that it leaves very little to the imagination, or that I couldn’t just get lost in words (because there are way less than I’m used to). Who knows, maybe it was, and still usually is, a combination of all these things. 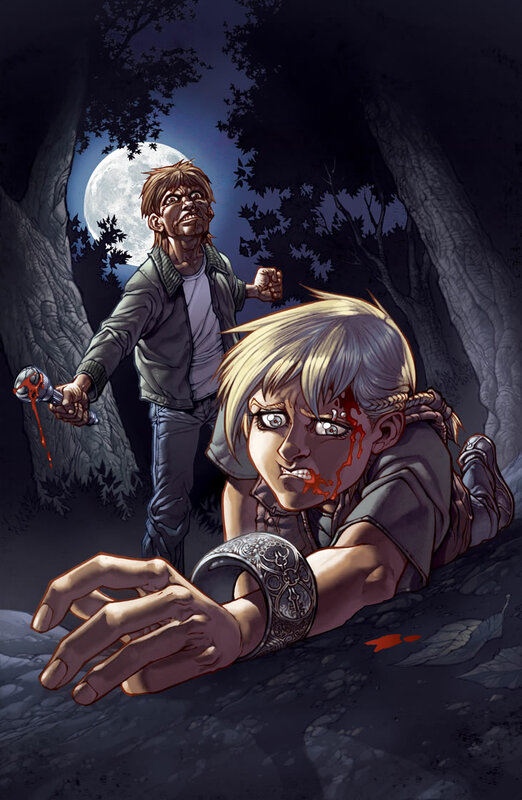 But, after a lot of convincing from my fellow Chapters employees and the recommendation from a booktuber that I adore, PadfootAndProngs07, I decided to try out the Locke & Key series. It’s written by Joe Hill and illustrated by Gabriel Rodriguez. I’ve only finished the first book in the series, but man it was so good! It was beautifully illustrated and incredibly visual. I found myself slowing down and taking the time to really soak in the characters body language and facial expressions in each scene. I quickly became attached to the emotionally complex characters, and wanted to make sure that they wound up ok. I have to warn you though that this definitely isn’t a happy-go-lucky story. Within the first couple of pages you see the father get brutally murdered, and the family’s luck basically only gets worse. After their father’s death that family moves in with their uncle (the father’s brother) into a mansion called Keyhouse, in a town called Lovecraft. The town’s name in itself doesn’t bode well for the family. For anyone who is unfamiliar with this reference, H.P. Lovecraft was an author who became incredibly famous after his death for writing tremendous horror stories. I just loved the the ominous names of both the mansion and the town. The story itself is so interesting. I love how many secrets the Keyhouse holds, and how you can see the story already building within the first book. 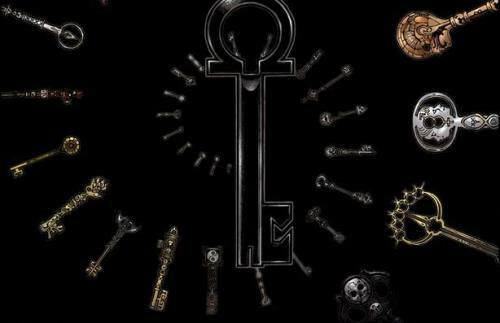 I’m definitely excited to see what the next books have in store for each new key that is discovered, and what they will unlock. The plot is a huge reason that I was convinced to buy the series. I mean, an old mansion on a secluded island that has secret keys to doors that can unlock magic and demons, how cool does that sound? This might sound odd, but this book reminded a lot of Harry Potter in its plot style. Hear me out – Girl gets sent away to boarding school, but there’s more than meets the eye at this boarding school, there are magical creatures like werewolves and vampires, girl befriends group of misfits, explores parts of the boarding school she shouldn’t, discovers a secret plot going on at the school, etc. I don’t want to give away the ending, I just wanted to note some similarities I found. It was similar enough to remind me of Harry Potter, but different enough to feel like an entirely differently type of book. Since I loved Harry Potter, I also loved the reminder of it that this book gave me. The story does go kind of slowly, but in a similar fashion to the Harry Potter books it seems like each book will have its own subplot, which will tie into a larger overarching plot for the series. Even though the plot itself moved a little bit slow, the detail and interaction between the characters made me whip through this book. 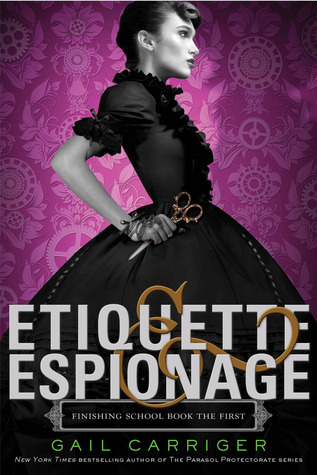 I simply adored the steampunk world that this book was set in. With vampire, werewolves, mechanical maids, boarding schools on giant blimps, the whole thing was amazing. The author did a wonderful job of describing the setting, and I always had a very good visual of what was surrounding the characters and what all the characters looked like. I really enjoyed that the main character, Sophronia, was able to roam her boarding school. This gave me a very good visual in my mind of how the school was laid out. I particularly enjoyed Sophronia as a character. She was silly, curious, adventurous, smart, sassy, and a very nice person over all. I wanted to become part of her world and be friends with her and her group of ‘misfit’ friends. That’s another thing that I enjoyed, her friends. They developed nicely throughout the book, and the new characters were introduced slowly and with thorough detail. All in all I truly loved this book and look forward to, hopefully, completing the series over this summer. P.S. Gail Carrigan also has another series set in the same world as the Finishing School series, called The Parasol Protectorate. I will definitely be checking that one out after I finish this series. Lola Nolan is a budding costume designer, and for her, the more outrageous, sparkly, and fun the outfit, the better. Everything is pretty perfect in her life (right down to her hot rocker boyfriend) until the Bell twins, Calliope and Cricket, return to the neighborhood. When Cricket, a gifted inventor, steps out from his twin sister’s shadow and back into Lola’s life, she must finally reconcile a lifetime of feelings for the boy next door. I’m pretty late to the Perkins party, but I’m glad I’ve finally arrived. 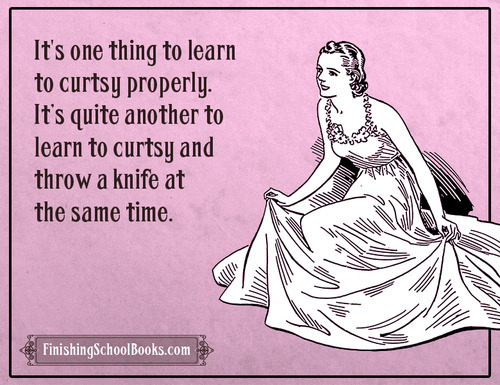 I initially avoided her books because of the somewhat cheesy titles. 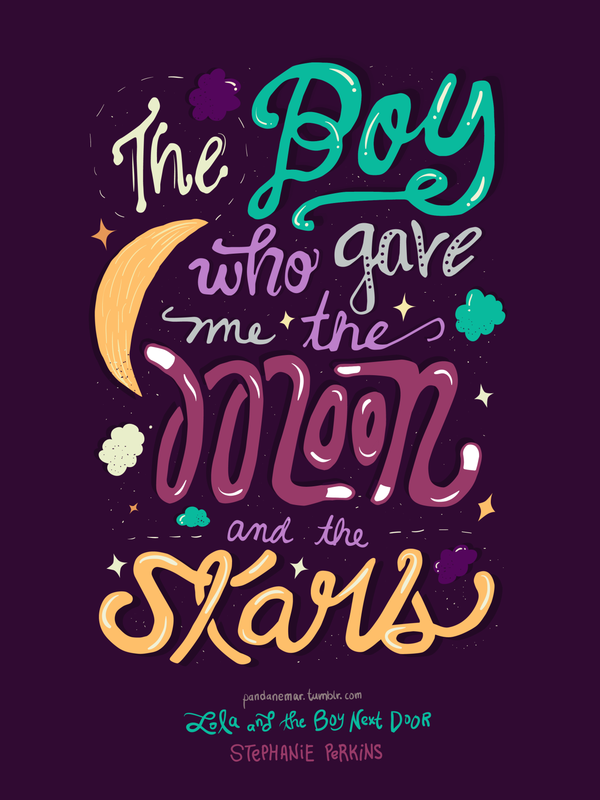 I thought that the titles reflected that the stories would be cheesy as well, and maybe they are in a way, but dang does Stephanie Perkins ever do YA romance well. I’ve always been a huge fan of books that have characters living together (especially boarding schools) or characters living in very close proximity, like in this book where the story revolves around neighbours. The main character, Lola, is extremely unlike myself, but Perkins wrote her in a way that I found myself identifying with her so easily that every heartbreaking moment for her was heartbreaking for me as well. This book was the perfect way to kick off my sunny summer reading vibes. 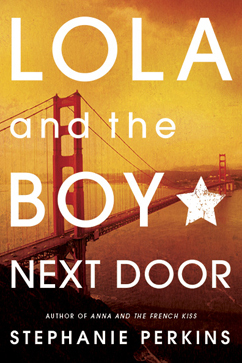 I enjoyed the complex way Lola navigates her old feelings for her neighbour while in a relationship with a different guy. It showed how complex and confusing romantic feelings can be, and that Lola didn’t always make the ‘right’ decisions all the time made it feel even more real. I feel like Lola grew well as a character throughout the book, and it was nice watching her figure out her complicated life, find herself, and then become a stronger person because of it. Now, can I just talk about Cricket Bell please?!!! He is definitely on my book boyfriend list now. His character is seriously the best, nicest, most generous, most understanding, most interesting, most adorable/dorky boy ever *sigh*. So, did I build him up enough for you yet? Haha. Hopefully my hype doesn’t ruin him for you, but I do really love how genuine his character is. I would definitely recommend this to anyone who loves extremely adorable and relatable contemporary YA romance. Don’t be deceived by the titles!! I will definitely be picking up other books by Stephanie Perkins now. This post is extremely late. I finished this book a couple of months ago, but I think after completing the Mara Dyer trilogy I just needed a little break from it. Because man oh man was it ever intense! I’ve read a decent amount of reviews where people really hated the ending to the series, but I have to say that I enjoyed it. I was most definitely expecting it to go somewhere completely different, maybe something more depressing and on par with the way that the story was heading. I liked that it didn’t go the way that I thought and that it kind of surprised me. I also liked that at the end of a very emotionally draining series there was a happy ending. To me this made all of my reading seem worth it. Nothing frustrates me more than when you read through a whole series, get attached to all the character, and root for their lives only to have that character die or have it end in a depressing and unsatisfying way. The third and final book in the Mara Dyer trilogy developed Mara’s character well, exploring her dark side and the psychological toll that the journey has taken on her mental well being. I enjoyed that it brought other characters in that could understand her messed up situation and provide support for her. This allowed both Mara and myself (the reader) to feel less isolated and frustrated by the challenges faced in the book. 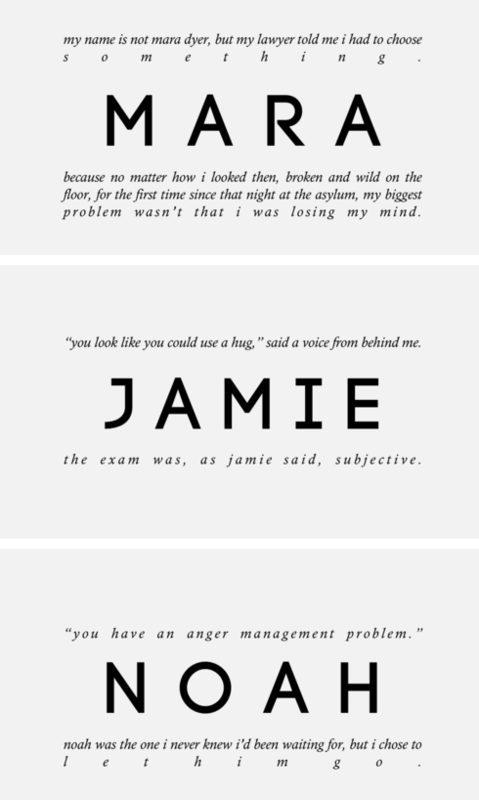 Bringing Jamie back in to the book allowed for some brevity and humour in the story, because man is her ever sarcastic and hilarious. I think this was key to my enjoyment of the third book, because by that point Mara’s perspective was very draining and depressing to read. By having Jamie in there it gave me some reprieve from the intensity. This leads me to another thing that I loved about this book… it feature Noah’s point of view! This was extremely well done, and completely necessary for the final scenes of the book. My one big drawback is that, although I liked the ending, it just seemed too happy for me. They just went through something ridiculously messed up and traumatic, but they’re fine and just going about their daily lives. Also, it never talked about what happened to the girl (who’s name I now can’t remember because it’s been so long since I finished it) who was stuck in the asylum with them and escaped and went through all the same messed up stuff they did as well. She just peaced it in the last half of the book and wasn’t really talked about again. But, mostly it’s all aces with this series. After the Affair of the Clockwork Scarab, Evaline Stoker and Mina Holmes are eager to help Princess Alix with a new case. Seventeen-year-old Willa Aston is obsessed with spiritual mediums, convinced she is speaking with her mother from beyond the grave. 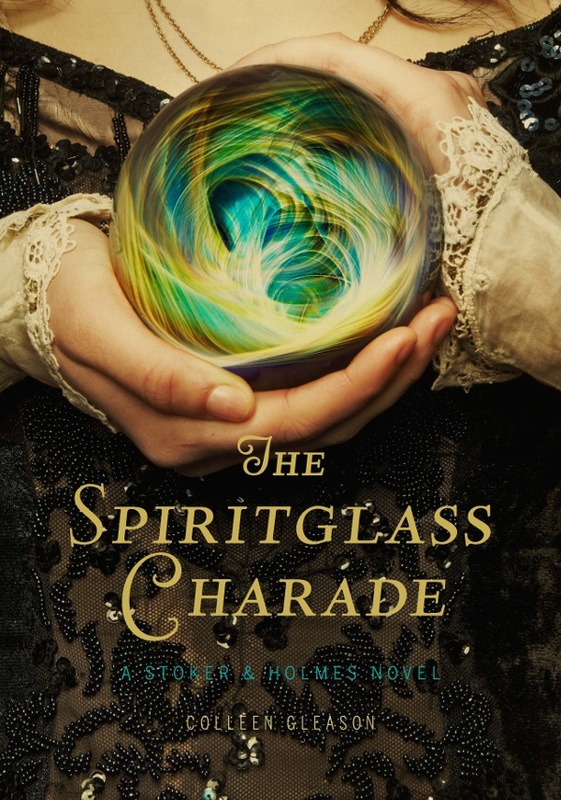 What seems like a case of spiritualist fraud quickly devolves into something far more menacing: someone is trying to make Willa appear lunatic,”using an innocent-looking spiritglass to control her. The list of clues piles up: an unexpected murder, a gang of pickpockets, and the return of vampires to London. But are these events connected? 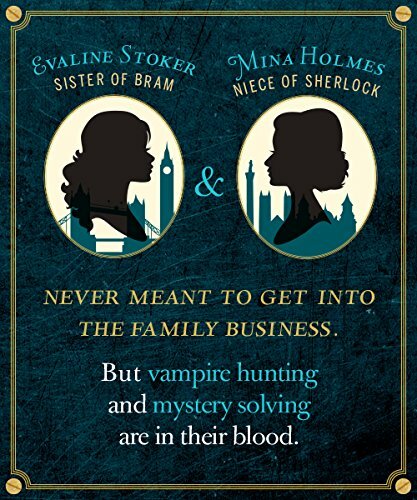 As Uncle Sherlock would say, ‘there are no coincidences.’ It will take all of Mina’s wit and Evaline’s muscle to keep London’s sinister underground at bay. This book is the sequel to The Clockwork Scarab by Colleen Gleason, which I really enjoyed. This book still encompassed a lot of the things that I liked about the first one and furthered the girls’ romantic interests as well. One thing that I dislike a little is that the books are moving quite slowly, and I’m now guessing that this means that the author is trying to turn these into a long series. I love the fact that it’s not quite the England of our past in these books, but instead it’s more of a Steampunk version of it. This is interesting because there is a character from our present time who has somehow travelled back in time, but the history books he learned from about England taught the same version of history that we know now. So the whole series, so far, you’re trying to figure out why the London that he has travelled back to is different from the one that we know of. I definitely think I am going to be searching out more steampunk books because I loved the Leviathan series by Scott Westerfeld and I love the very cool settings in this book. The drawback in this series is that the settings are most of the time not fleshed out enough. Most people don’t know what to picture in a steampunk world, and even if you read steampunk books a lot each world will be different in different series. I sometimes had to stop and take a minute to try and figure out what Gleason was describing, or had to fill in details myself, which detracted from the flow of the book. I’m also just extremely intrigued by the world itself and would have loved more vivid and detailed scene setting to dive into their lives better. I do have to say though that I think the settings in this book were more flushed out than in the first book. I like the girls’ love interests and enjoy that it’s nicely added in but definitely doesn’t revolve around romance. The cases are most definitely the central focus, but the flirtations add a good amount of excitement to the book. Again my one complaint here is that it took me two whole books to really put together all the descriptions of the male love interests to actually be able to picture them. Maybe the vague description is a stylistic choice, letting the reader imagine most of it themselves, but I’m personally not a huge fan. I still really enjoy the characters, and the flipping narrative between Mina and Evalines’ perspectives. I love the idea of the world they live in and I like that each book is a super fast paced read revolving around one case, like an episode of Sherlock in book format and aimed at teen girls. P.S. I’m going to start adding in links at the bottom of my posts for where you can buy the books online that I review. I do, however, highly recommend buying books at physical bookstores as this better supports authors and publishers a lot of the time.